The trails at Catoctin Mountain Park offer challenging routes with plenty of scenic views. Varies, depending on the trail. The park offers 18 miles of trails, including a 3.7-mile, 4.2-mile, and 8.5-mile loop. Varies, depending on the trail. Nestled in the eastern reaches of the Appalachian Mountains is Catoctin Mountain Park. The park takes up eight square miles and houses the Camp David presidential retreat. Located on Catoctin Mountain in Thurmont, Md., the park offers around 18 miles of trails, which includes an 8.5-mile loop with several scenic overlooks and other trails that traverse different parts of the mountain. One of the many camps within Catoctin Mountain Park is Camp David, which was completed in 1938 and has served as a presidential retreat since 1942. That portion of the park is not open to the public, but much of the remaining portions of the park are. The trails are broken up into two sections: those on the eastern side of the mountain and those on the western side. The east side is more challenging but has rest stops that overlook the valley below. The trails on the west side are a bit easier and they're home to lots of wildlife. You'll also see wetlands in this section. A good loop for experienced hikers is the 8.5-mile trek around the eastern side of the mountain. Starting at the visitor's center, you'll head east and turn north to stop at Chimney Rock — be sure to take a photo of the breathtaking view here. From there, you'll continue north and pass other scenic spots before turning west and then southwest. When you're heading southwest, Camp David is somewhere off to your right — its exact location is not noted on official park maps. Once you reach Cunningham Falls, a 78-foot cascading waterfall, you'll turn east and head back to the visitor's center. That circuit ascends 1,370 vertical feet and has several stream crossings, so it's not the easiest of hikes. And be sure to bring food and water with you. A good pair of hiking boots is recommended. The western side trails have shorter loops, so they're better for a quicker hike and/or for less experienced hikers. A good loop to try here starts at the Chestnut picnic area and goes to Cunningham Falls. That route is 4.2 miles round trip. There's also a 3.7-mile loop accessible at Owens Creek. One thing to keep in mind: Certain roads and trails are subject to closure at any time because of Camp David. Be sure to check nps.gov/cato before heading to the park. 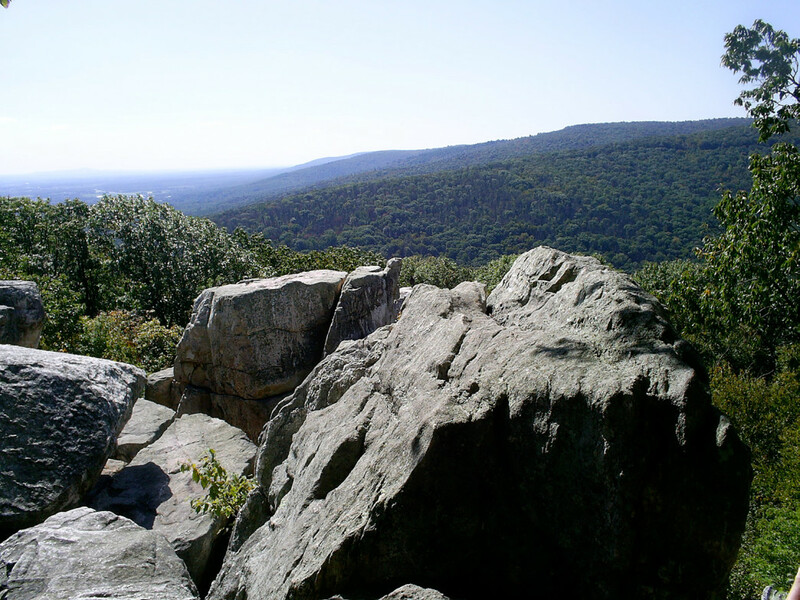 Experienced hikers will appreciate the challenging terrain Catoctin Mountain Park offers. And the scenic viewpoints allow you to see for miles down to the valley and the surrounding towns. A camera is a must-have item if you plan to visit this park. Catoctin Mountain Park is roughly 70 miles from downtown Washington. Take 495 to 270 north, and then exit onto Rt. 15 north once you reach Frederick, Md. The park entrance is 21 miles off the exit for Rt. 77 west.